My new stuff is nothing like my old stuff was, And neither one is much when compared to the show, Which will not be as good as some other one you saw…. Similarly, I once heard singer/songwriter Tift Merritt say that she didn’t see the point comparing songs in songwriting competitions. Music, and songwriting in particular, is a unique personal expression and by definition cannot be compared to another experience. Writing a song is like climbing one’s own personal mountaintop…it’s a different vista than the last one, and different still from one that will come later. Even covering a song becomes a unique expression of where you are at the time. Someone may have already climbed that mountain, but you have a your own perspective and you see things from the top that the original artist doesn’t simply by investing your own energy in it. We invite you to invest your energy and sit atop the mountain with us this weekend. 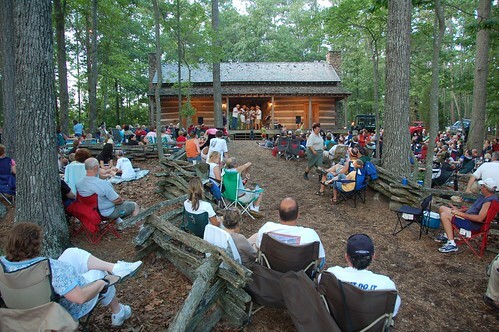 This Friday and Saturday, July 5th and 6th, The DejaBlue Grass Band will play 2 nights at Red Top Mountain State Park. Admission is free. We’ll play songs from our perspective, many we’ve written and some others have written. Some new and some old. Some you’ve heard, some you haven’t. Bring your family, plenty of lawn chairs, a cooler full of goodies. The venue itself is worth the experience….Dare I say, there is nothing that compares to it!